Back to the Island 2018 wins gold for the strangest event yet. The timing couldn't have been worse for a lot of U.S. fans with a snow storm traveling up the east coast, and despite living in a mild climate most of the time, I became one of many with a canceled flight. You never expect to get snowed in in South Carolina, but the day before I left, six inches of snow fell in Charleston and shut down everything due to impassible roads. I found myself scrambling to rebook a flight for the second year in a row. (Last year a thunderstorm grounded my flight from Myrtle Beach, so I had to drive to Charleston instead. This year I just went ahead and booked out of Charleston to begin with, so naturally that backfired, too. Next year I'm hiring a mail boat). Thankfully I was able to work with American to find the only airport in the area with a seat left that would get me to Jamaica the same day, and I made it. And for the second year in a row, my last minute flight change put me on a plane with Hanson. I don't know what kind of weird backwards luck that is, but I'd honestly prefer to forego sharing a plane with Hanson if it means getting to Jamaica on the first try. Maybe next year. As I finally descended into Jamaica, the usual beautiful blue aerial view of the island was obscured by fog. I spent the first two days swimming in a hot tub in the rain and substituting my usual cover-up with a rain jacket. I was already sick when I arrived this year, so throw in some major coughing to round out the not-so-perfect paradise image. I'm lucky my friends didn't quarantine me for the whole trip. The rain and the dozens of flight cancelations led to the first concert being postponed an extra day. By day two, it was still too windy for the beach stage, so we wound up experiencing Zac's solo, Chris Carrabba, and the Rock All Night set in what was essentially a giant greenhouse wrapped in plastic that looked like the inside of a tanning bed. The shows were good, but obviously they would have been better on the beach. Still, I appreciate all of the hard work Island Gigs and Hanson put into making sure they happened anyway. The show must go on, and they probably moved mountains to make it happen. Zac went first and kicked off the event with "On the Rocks," which ended up being an entirely appropriate theme because the beach near the stage was dangerously rocky. He struggled with one song but I don't even remember which one, so apparently I'm not too phased. Other highlights include his first time ever soloing "Misery" and a brand new song called "The Ballad of Seymour Better Times." It was a cute and funny song that I doubt we'll ever see on an album, but I do hope we get a recording of it on a future member kit or perhaps Digital Pants. It had a great punchline at the end and I really liked it. Isaac's set was last and probably the most mellow of the three, and I have to give him props for not making me cry this year. One of my favorite parts was seeing him play around with the loop pedal during "Leave the Light On" and adding in a fun and unexpected guitar solo. He told us he was going to play a song he wrote just a few weeks ago, but at the same time seemed to be improvising a new song on the spot while tuning. It was so put-together and sounded so good that I assumed he must be singing the new song after all. When he flubbed the ending I realized that he really had just been making it all up on the spot. It was super impressive for an off-the-cuff song and I hope we'll see the recording on hanson.net later. Isaac should definitely be proud of himself for that one; I know I was. Taylor's solo set probably would have been my favorite this year even without the surprise side excursion. About two songs in, he started talking about how some things can only be done on a beach in Jamaica. He said Zac and Isaac would probably tell him it was a bad idea, but they weren't there to stop him. During all of this, I realize he's pulling off his socks and I'm standing there confused and excited waiting for him to drop whatever bomb he's about to set off. 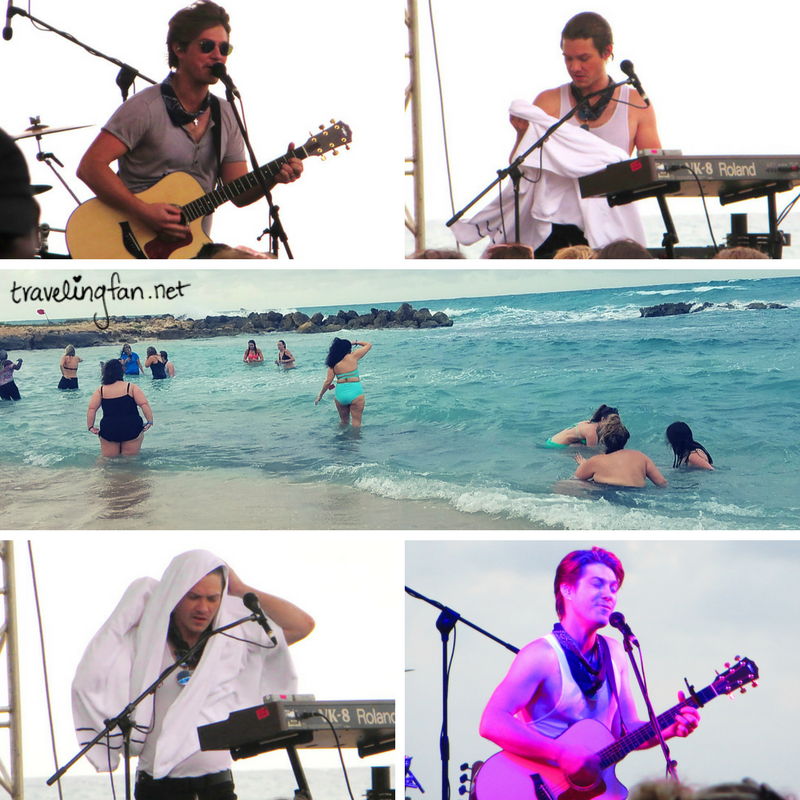 He stripped off his over shirt, invited anyone up for it to go for a swim in the ocean with him, and ran off the side of the stage and into the water without further notice. For all my talk about owning too many swimsuits, this moment is exactly why I'm always wearing them under everything at BTTI. 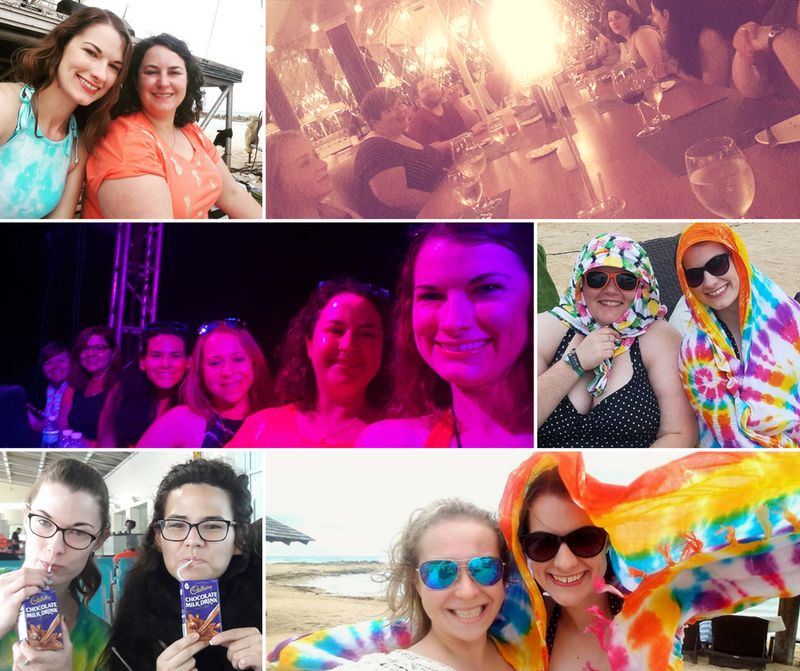 It paid off this year, because when the moment came, I was standing in the back wearing a bikini and a coverup, and it took me all of three seconds to be heading towards the beach. The whole thing was kind of stampede-ish and was probably cringeworthy if you let yourself think about it for more than a second, but it felt more like a Do Go Be moment to me than something to be embarrassed about. After all, it came with an invitation and it seemed like a once-in-a-lifetime moment. So about a quarter of the crowd followed Taylor to the edge of the water, a smaller number was brave enough (or dressed) to go all in, and just about everyone tripped all over the rocks along the way. I went in towards the back away from Taylor and got caught up on rocks immediately along with two other girls I didn't know. Instead of trying to get near him, we spent a hilarious minute flailing around each other, fully submerged in about a foot of water just trying to stand back up again while the waves kept raking us over the rocks. If you ladies are reading this--thanks for the laughs! My friend Yelena captured a picture of the moment below. Taylor went on to play two of my favorite solos--"Crazy Beautiful," and "Believe," which I'd only ever heard once in a sad carpeted room in Cancun, so this time was a significant upgrade. I love "Sunny Day" even when it's been raining out, and "Be My Own" was beautiful as always. It was a solid set and definitely my favorite solo show this time. I hadn't seen Stephen Kellogg since he toured with Hanson back in 2008, so it was fun seeing him again. We actually watched his set from the balcony of our room while eating room service dinner in rocking chairs. It's the best way, really. Chris Carrabba as a special guest really made the trip for me though, because I loved his music back before I rediscovered Hanson, and I got to tell him so. While most of you reading this were defending your honor to Hanson haters back in high school, I was off blasting Dashboard Confessional and Something Corporate without a second thought for those MMMBop guys. Now here I am, 15 years later standing on a tropical island with both of them. Life can be weird and great. Really enjoyed getting to hear @chris_carrabba at #BTTI2018! Hands down, this was the best BTTI special guest set I can ever remember. I enjoyed Cards Against Humanity again even though I didn't get the opportunity to play, and I thought the added Hanson-themed cards were a fun twist to mix things up a little from last year's event. The "Old MacDonald had a _____" round that someone insisted he sing all of the answers to was the best. During the last round, a girl two seats over from me stripped off her dress and proceeded to walk up to the stage in her bra and underwear when her number was called. Everyone was super confused, Zac ignored that it happened from what I could tell, and the game ended after that. I spent a minute trying to figure out if she was wearing a swimsuit (nope) and then trying to reason that her bra covered more than plenty of the bikinis I had seen so what did I really care? I ultimately walked away thinking that even if she had been wearing a swimsuit, that's still a super weird and inappropriate thing to do when a Hanson calls you up to play a game. It hit me during Taylor's solo show that we had all just collectively shamed a girl for pulling off her dress in front of Zac, but then I went and removed my own dress in front of Taylor (more like in the very back in his distant presence) and ran into the ocean with him. It's ironic, but there's one major difference: an invitation. Family Feud went a lot more smoothly this year, but it felt like there wasn't much crowd excitement. By the end, anyone that wanted to go had the opportunity to participate even if their number wasn't called. My favorite part of the night was when my roommate Rachel answered "Name something you wouldn't want to happen while riding in a taxi" with "Get lost," and Isaac got super shocked and offended for a moment thinking she was telling him to get lost before realizing that was her actual answer. We all had a good laugh including Isaac once he realized he wasn't being insulted. Tie dye on the other hand was a bit of a letdown for me this year. None of the guys ever made it to the table I was at, and I somehow managed to make my worst shirt yet. It looked completely saturated with dye, but when I opened it up back home it's almost all white. This is where I shrug and hope next year is better and am thankful that it wasn't my first or only shot for a good tie dye experience. The "Rock All Night" set had the potential to be my favorite if not for the change of venue and the somewhat short setlist. I have to say I was pleasantly shocked at how much I loved "Oh La La La" as an opening song because I never really cared for it on the EP. The show was heavy with songs from "The Walk" (Blue Sky, Tearing it Down, Something Going Round) which is always fine by me, and I know so many people were thrilled to finally hear "World's On Fire." Getting to see Chris Carrabba perform "Back to the Island" with Hanson was a great moment and I hope just the beginning of a collaboration I'd love to see again. "You Shook Me All Night Long" was the perfect ending for a rock themed set, and I'm not even a little bit disappointed that they repeated it on the final night. My favorite part of the Members' Only night was "Coming Back for More" with Stephen Kellogg. It's one of those obscure songs that I forget exists most of the time, which means I always forget exactly how much I love it until I'm hearing it again. It's hard to believe the first time I ever heard it live was also with Stephen Kellogg--ten years ago! "No Rest for the Weary" was another standout, and while I love "I Don't Want To Go Home," I completely tuned out the second half of it because baby sea turtles started hatching next to us by the soundboard. I didn't even realize the show was over at first because I was busy trying not to step on turtles. How's that for an epic finale? I've never waited long for a BTTI show, but something possessed me to plant myself in the front row for the final show this year. Despite my initial disappointment at the announcement of a singles set, I really enjoyed myself and felt like the crowd energy was strong. I lost about half of "Weird" to silent giggles when I looked over and a random tractor was driving by on the beach, completely out of place during a somber moment. We were all just looking at each other and pointing at it whispering "Isn't it strange?" and dying about it while Hanson seemed unaware. We found out more turtles were hatching right at the beginning of "I Was Born," and Taylor got excited right along with us and kept making references to them in his speech and telling them to DO, GO, and BE. He changed up the lyrics to "Don't want a ticket to the same marine" and "Don't underestimate the sting of the little turtle" which sounds so silly, but the crowd ate it up. Zac reminded me how great "I Believe in a Thing Called Love" is live, complete with belting the final high note right in my face. No camera or video could capture the wide-eyed crazy look that accompanied those high notes, but I don't think I'll ever forget it anyway. This year's after party was probably my favorite. I thought the space it was set up in lining the street was perfect. There was plenty of room to dance, a bar within arm's reach, and plenty of places to sit and hang out and take it all in from more of a distance if dancing isn't really your thing. I enjoyed getting to hang out with my friends a bit further back without feeling like I was missing anything but also without feeling like I was being judged for not dancing more. I'm glad I stuck around because I got to see the moment when Taylor decided to bring up the entertainment staff during "Pony," and now I can feel like I basically got to see male strippers at a Hanson event, though thankfully their clothes stayed on. It was hysterical and I'm not sure Taylor knew what he was getting himself into by bringing them on stage, but it certainly made for a unique and hilarious moment for me as a spectator. So it wasn't the best and it wasn't the worst, but it sure beat being snowed in back home. "Isn't it strange" felt like the theme of the trip, and I can't help but embrace the weirdness and be thankful for another unforgettable experience. Sure we got rain and dark walkways and limited hot water, but we also got turtles and a tractor and synchronized swim dancers and a surprise field trip into the ocean with Taylor. I spent it all with friends who would apparently rather get sick with me than stay well without me, and that's the best kind I could hope for. I live for those random unexpected moments, and BTTI 2018 provided plenty of them. Whether there's rain, shine, or rocky beaches--Back to the Island is my patch of green. 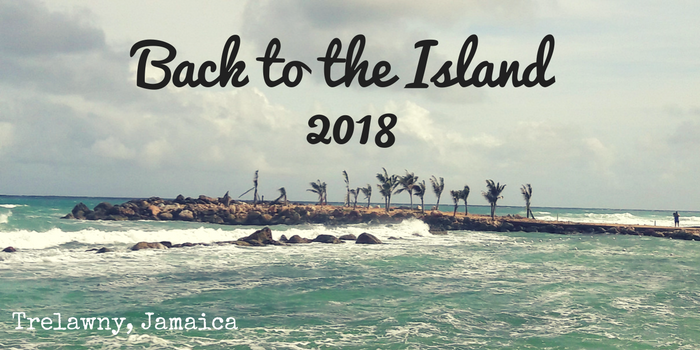 Loved this post :) I hope I can make it to BTTI one year! I'm finally making it to HDAY this year though!